Leek moth (Acrolepiopsis assectella) is an invasive pest of European and Asian origin. The first North American detection occurred near the National Capitol Region (Ottawa) in 1993. Since then, the leek moth has spread west through Ontario, east towards the maritime region (Québéc, New Brunswick, Prince Edward Island), and south into the United States (New York and Vermont). Long-range dispersal may occur through wind currents and by movement of infested plant material. Most injury in Ontario has occurred in leek and garlic, generally on small, diversified farms. The leek moth is an Allium specialist, attacking both wild and cultivated species. When left unmanaged, larvae can cause significant damage to garlic, leeks, onions (dry bulb, green), shallots and chives. Leaves, stems, flower stalks, scapes, and bulbs may all be affected. Feeding injury varies depending on leaf architecture of the crop. On flat leafed alliums such as garlic and leek, larvae mine through folded leaves, creating pinholes and longitudinal grooves. In onions, shallots and chives, larvae feed inside the hollow leaves, creating a “windowpaning” effect. Damage to the leaf causes a reduction in plant growth and creates entry points for fungi or bacteria. In garlic, the leek moth larvae have the potential to bore into the scapes and cloves. Infested bulbs may have decreased storage life. Damage to leeks and green onion render these crops unmarketable. Leek is at high risk for injury because it is a preference host plant and because it is harvested later in the season, when leek moth populations are at their highest. Figure 1. Leek moth larvae – photo courtesy of A.M. Brauner, AAFC. Larvae are slender, yellowish-green in colour, and up to 14 mm at maturity. They produce copious amounts of pale frass as they feed, which becomes evident when leaves are pulled apart. Mature larvae exit the leaves to pupate, either on the outside of the plant or on other nearby plants. Pupae are enclosed in a mesh-like-cocoon, very similar to that of the diamond-back moth. The adult moth is small (5-7 mm), reddish brown, and with a white triangle shaped spot that is visible when the wings are at rest. There are multiple generations of leek moth, the number of which varies by region. In eastern Ontario, where most research has been conducted, there are usually 2-3 generations per year; we expect up to 4 in the southwest parts of the province. Adult moths overwinter in protected areas (windrows, buildings and plant debris), with activity in the spring occurring in mid-April to mid-May. Once mated, overwintering females begin to lay eggs when night temperatures are above 10°C. Eggs hatch several days later, and neonate larvae move quickly into the plant, where they are protected from pesticides and most natural enemies. This leaves a very small window of opportunity for targeting insecticide applications. Researchers at Agriculture and Agri-Food Canada (AAFC, Dr. Peter Mason’s lab) have developed decision support tools to facilitate management of leek moth, including optimizing the use of pheromone traps and refinement of a degree day model to track development and predict generation time for leek moth in eastern Canada. At a threshold of 7 °C, leek moth requires approximately 445 day-degrees to develop from egg to adult ((Max Temp + Min Temp)/2) – 7°C). Accumulation of degree days starts one week following peak flight of male moths captured in pheromone traps, and is reset to zero for each generation. Generation times shorten in warmer weather, and can be as little as 3-4 weeks. Precise timing is required for successful management strategies such as application of insecticides (applied around peak egg-laying) and / or the use of exclusion barriers (in place prior to flight of generation). The timing of an insecticide application is often most effective 7 days after the peak pheromone trap capture. If flight activity in a generation is extended, additional sprays may be required (following label recommendations). Pheromone traps must be set up in late winter (early April), before the expected overwintering adults become active. Place at least two traps per field, near perimeters, as this is where the highest leek moth numbers are usually observed. Pest pressure and crop risk increase as the season progresses. While management early in the season may help to reduce subsequent generations, sporadic spring activity may make timing difficult. A number of products are registered for leek moth suppression however only Matador is registered for control on garlic, leek, dry bulb onion, green onion and shallot. Floating row covers are often the most effective pest management strategy, but they are not generally implemented over large acreages, likely due to feasibility concerns. As mentioned previously, these must be applied prior to adult activity in each generation. If possible, observe a 3 year crop rotation and avoid planting near infested areas from the previous season. 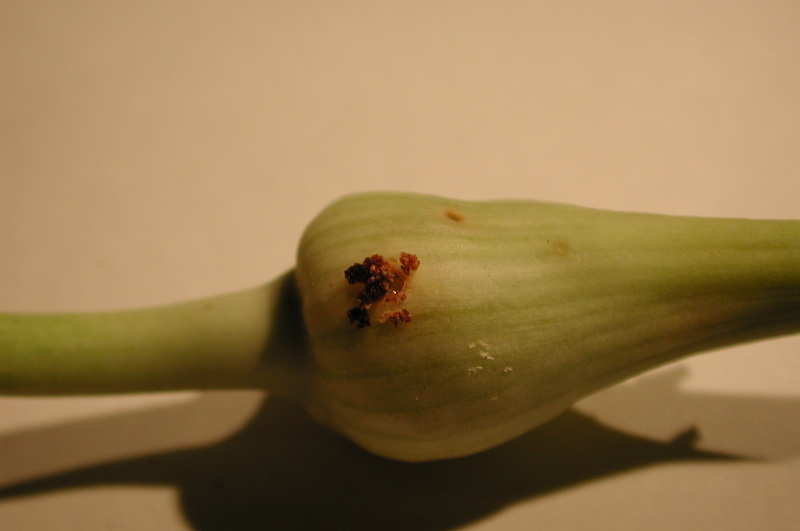 In garlic at scape removal, collect and destroy scapes that show any sign of leek moth damage. Burying and/or destroying plant debris at the end of the season will also reduce pupae and larvae populations that remain in the field after harvest. Potential biological control agents have been screened for effectiveness as a natural enemy against leek moth in several parts of the world. Diadromus pulchellus, a parasitic wasp naturally found in Europe, was released in 2010 within the Ottawa Valley following extensive screening for non-target impacts (AAFC and CABI Switzerland). Early research shows that D. pulchellus overwinters in Ontario, but its impact in reducing leek moth populations needs further evaluation. We are conducting a survey in 2018 to determine the current range of leek moth in Ontario. If you observe leek moth damage please contact Travis Cranmer at travis.cranmer@ontario.ca or (519) 826-4963. For more information and visuals of leek moth damage and life stages, see OMAFRA factsheet 08-009, Leek Moth – A Pest of Allium Crops.